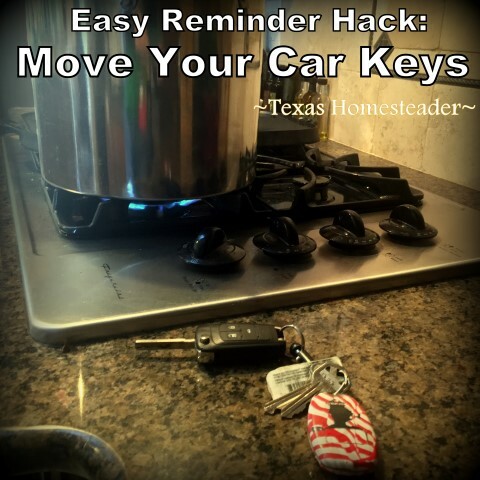 Do you worry about forgetting something like unplugging a coffee pot or turning off the stove? Or do you hate when you go to someone’s house and just know you’re gonna forget to pick something up, and then you DO forget?? I’ve found a simple hack for remembering tasks like these. Intrigued? Check this out. Recently I was simmering a turkey carcass to make Homemade Broth. Y’all know to make really good broth, it needs to simmer for a while! But we had a quick errand to run later in the day. We would only be gone for an hour or so, but for safety reasons I certainly don’t want to leave the stove on. I really needed to make absolutely certain I turned off the burner before we left. I knew we couldn’t leave the house without the car keys. So I told RancherMan I was going to move them temporarily. Then I placed his car key next to the stove. That way when they weren’t on the hook where they belong, we’d remember why we moved them & turn off the stove. This hack has successfully served me well in a number of situations! Once we went to a family member’s home in another city, I placed RancherMan’s car key on top of the fridge to remind us to grab our dish before we left. We couldn’t leave without his key. When it wasn’t in his pocket we remembered our leftover food and pulled it from the fridge when we went to retrieve his key. And when I needed to remember to take some veggie seeds to a friend at church, I placed them on our countertop & then placed his car key next to it. When he picked up his key, I picked up the seeds. easy peasy. Heck I’ve used this Homestead Hack for so many reasons I can’t begin to list them all. Sometimes the low-tech ways really are the best! 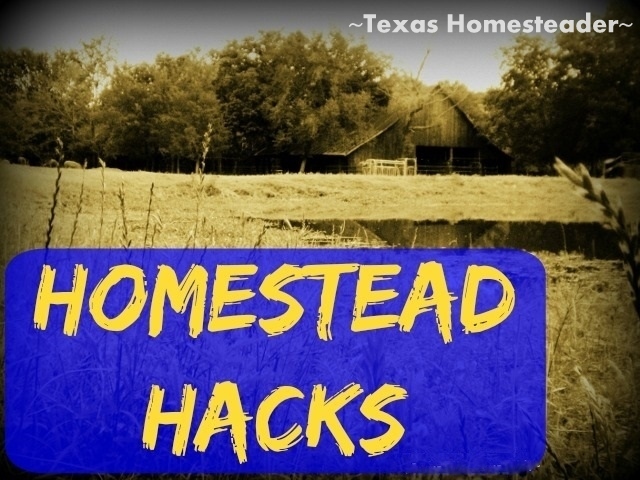 This entry was posted in Blog Posts and tagged Homestead Hacks on January 24, 2019 by Texas Homesteader.